KUALA LUMPUR , Dec 17 2013 – The National University of Malaysia (UKM) won the Best and Most Creative award and a cash prize of Rs 3,000 at the inventors’ exhibition and competition known as PENCIPTA 2013 here recently . The Systems Process Engineering team of the Fuel Cell Institute ( SELFUEL ) UKM invented a Hydrogen Fuel Cell Car which clinched the honour of the Best of the Best Invention of the Year award . The team consisted of Dr . Edy Herianto Majlan , Prof. Dato’ Ir. 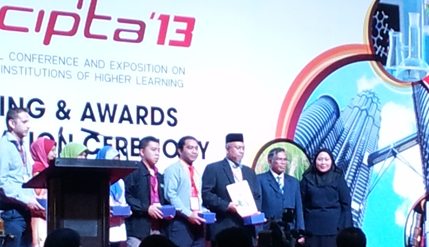 Dr. Wan Ramli Wan Daud, Prof Dr . Jaafar Sahari, Rosemilia Rosli , Siti Afiqah Abdul Hamid and Dedi Rohendi . Prof. Wan Ramli , who is also director of SELFUEL said the Hydrogen Fuel Cell vehicle is a golf cart driven by hydrogen exchange membrane ( PEMFC ) fuel cell which produced power of 3 kW for the vehicle ​​using hydrogen energy . According to Prof. Wan Ramli, cells are environmentally friendly and have high energy efficiency of up to 50 % , compared with 30 % for a typical car engine . He said the cell can be made small and easily built , lighter than a typical car battery (25 % by weight of the battery) and has a high energy density. Fuel cell car engines do not emit any polluting emissions or smoke . On the whole , he added , this car is very efficient with reasonable maintenance costs . SELFUEL is planning to build a prototype fuel cell saloon car in the near future. SELFUEL was established in 2006 as a research institute in Malaysia to do research on fuel cells. The institute began operation officially with the appointment of Prof Wan Ramli as the founding director by the Vice-Chancellor Prof Tan Sri Dato’ Seri Dr Sharifah Hapsah Syed Hasan Shahabudin in January 2007.